My latest pattern has finally made it’s appearance in the shop. 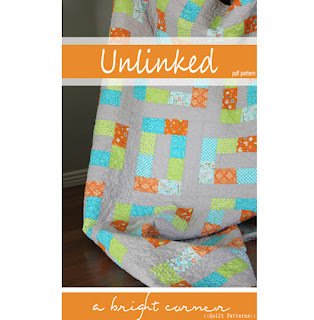 It’s called Unlinked and it includes instructions to make three different sizes: Baby (45” x 45), Throw (45” x 60”) and Twin (75” x 90”). The quilt pictured here is the throw size, made from Kona cotton (Snow, I think) and six fat quarters that I had on hand. I love the bright, fun colors and how they pop against the crisp white. …and of course I’m a sucker for a stripey binding. This one is from the Happier line (Riley Blake) as well. The pattern is a beginner level and is a fairly quick quilt to assemble. If you’re interested in a different size, or perhaps a quilt done in other colors, I do take custom orders through my etsy shop. I love it! What a fantastic pattern!